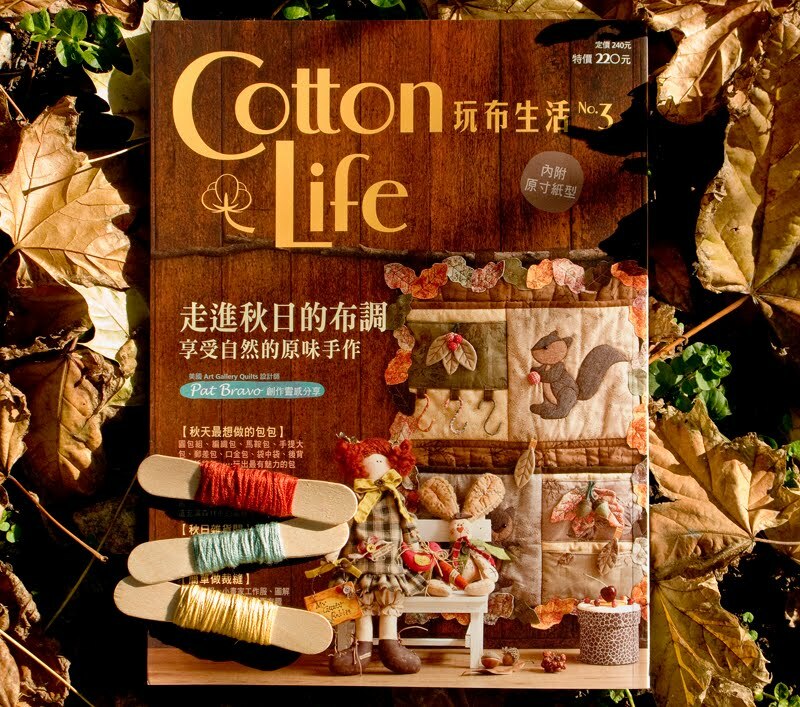 As one of the pattern designers, I am proud to present "Cotton Life" all the way from Taiwan! This new sewing book has a great Zakka look! There are photos for each step of every project so it very easy to follow even if you do not read Chinese. All measurements are in centimetres and includes full-size templates. Each issue includes 28-32 projects including accessories, clothing, housewares, bags, quilts and much more! 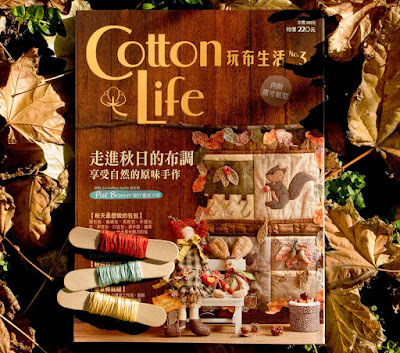 Cotton Life no.3 includes my Autumn Leaf Bag set! 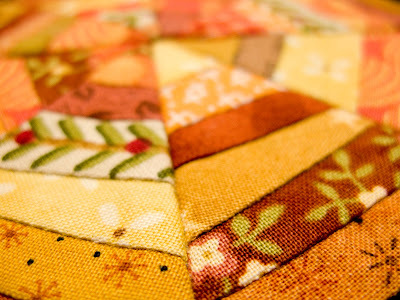 Look for my patterns in every issue that follows! Now you can find them in my SHOP. I drooled all over this delicious wool at the fabric store so they made me buy it! I love Autumn colours! 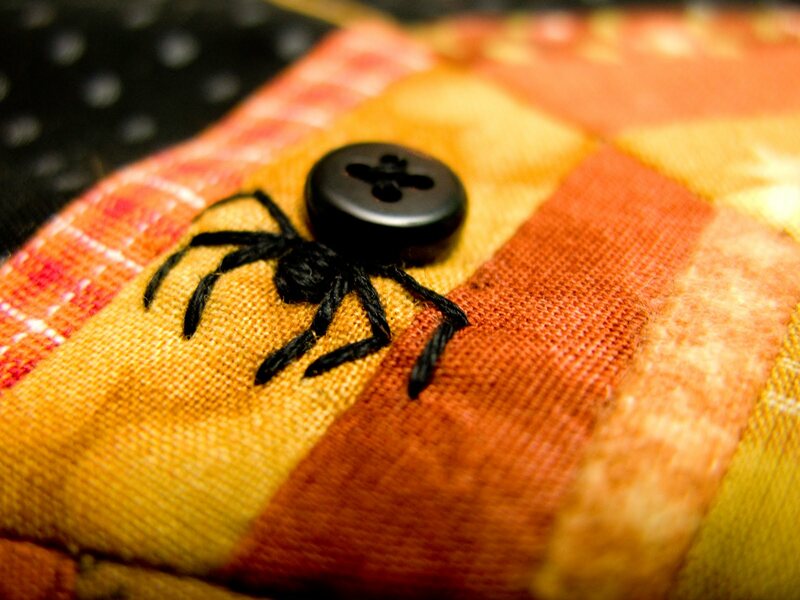 ... and what would a patchwork spiderweb be without a button spider! good work!!! I like it!!! The button spider is soooo cute ^.^ Looks like real one (O.K., better than a real one... real ones are not cute). I love the spider web quilt! What a great idea and it is something I would be more likely to make than some of the other Halloween quilts. Very clever. You are so clever. Your little button spider is genius! So simple and so incredibly cool. The button spider is just the best! :-) You are an idea maker deluxe! Congratulations on seeing your patterns in print, and in Chinese! Imagine! That's so cool. Your spiderweb block is aces. 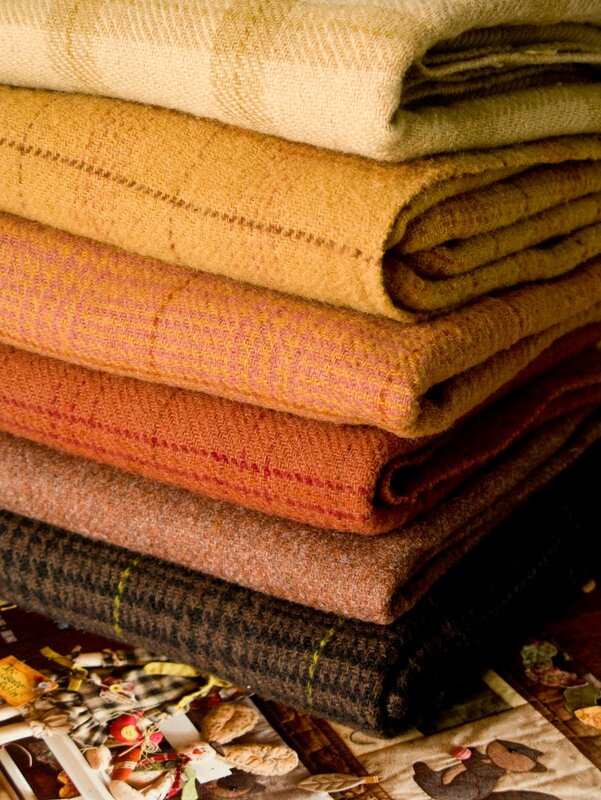 and i can see why you love those wool fabrics-great colors!! I love your work. The spider is great. Your patchworks are inspiring. i love your creation i really love them, i love a magazine called Handmade i've bought it in taiwan last year but it is impossible to find it in the net if you don't speak chinese! Lovely magazine and reasonably priced in your shop, but I nearly spat out my coffee when I saw the postage. US$37 isn't really reasonable to ship a magazine to Australia. I might have considered $10 shipping, or maybe even $15, but I could buy several books on quilting from bookdepository for that price. If you can make the postage cheaper I'd consider buying from you. As usual---all beautiful! Congrats on the book article, you are so good!! Congratulations for being part of the part - it looks wonderful. Love the spider and web! your work always so beautiful! i love all of them! Your work is truely amazing! I also adore that french press cozy and the zipper pouches in cotton life! They are all truely amazing and so inspiring! I want to make them too for me. :) Oh and these wool fabrics are gorgeous and i really adore the lovely fall colors! Have a lovely emrry happy day and love to yoU! I love it!!! It is beautiful!!!! The wool is gorgeous too!!! Laurraine Hi, I think I've lost count of how many times I visited your blog cute in all these visits I always admired his work as if at home, I think everything always so beautiful, so warm that even makes you want to go. For this and other endless reasons that I decided to make a link with a photo of your monkey blankets, indicating your blog on "MY BLOG". Yupiii \ o / I was very happy and I'm sure readers here my friends from Brazil, will also be delighted to come visit you in ° patchwork pottery ¨. Hope you can come meet me at my blog, and can follow me as I follow the delicious and darling little corner. I thought spiders had 8 legs?! Don´t they? Thank you so much for your lovely message! It gave me a big smile! E-mail me sometime and then I can reply to you properly :o) Your blog is lovely and thank you for the special link! so very cute!! And the addition of the spider is the icing on the cake. found your Spider Web quilt via Pinterest and WOW!!! How cute... I want to make one of my own... as I run upstairs to see if I have any scraps that will work! :) Thanks for sharing! Wonderful, wonderful block!! I especially LOVE your spider ... would you mind if I shared him on my blog with a link to your blog? I just designed a block for the Glorious Autumn Block Party by Quilting Gallery and included a spider ... your's would be a fantastic alternative to my appliquéd spider. Thanks so much for the inspiration! I made two little mini-quilts/hot pads. You can see them here. I love the creative way you did the spider! Good Job! Olá! sou do Brasil e queria muito comprar suas revistas , como faço? 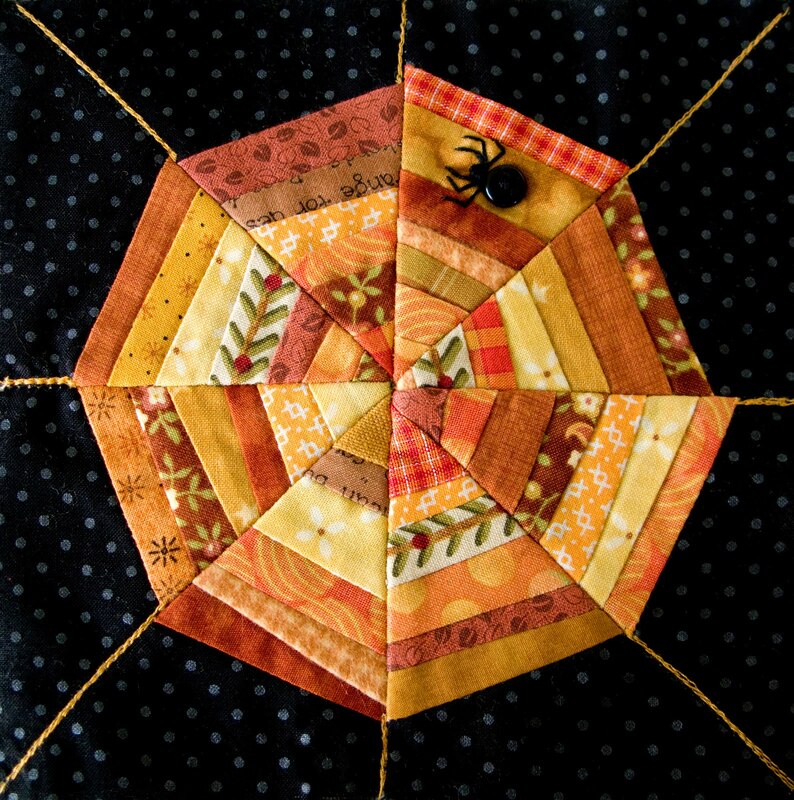 Laurraine I love your spider creation and would love to share this blog as an attachment and advertisement for your book/blog with a prize for tabletopper patterns within our local quilt group. Is that permissable? The legs & bottom of spider would be fun to put under a button on a shirt.